After tragedy robs her of everyone she loves, Jeannette Mason retreats to the tiny Oregon seaside town of Hope Harbor to create a new life. Vowing to avoid emotional attachments, she focuses on running her lavender farm and tea-room–until a new neighbor with a destructive dog and a forlorn little girl invades her turf. But she needn’t worry. Dr. Logan West is too busy coping with an unexpected family, a radical lifestyle change, and an unruly pup to have any interest in his aloof and disagreeable neighbor. 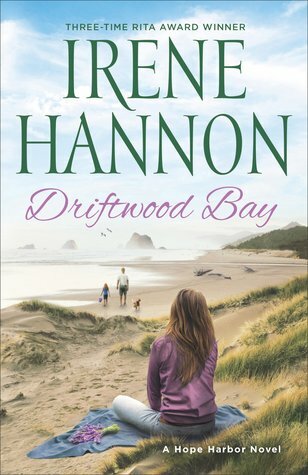 Driftwood Bay by Irene Hannon is a sweet heartfelt tale. One that showed the depths of love, loss, and grief. There was also a theme of hope and new beginnings. A young man loses his brother and mother. Now, he has to care for his five-year-old niece. At first, it appears nothing is working. They adopted a beagle that is more trouble than he bargained for and his niece still doesn’t reach out to him. It takes for his niece to run away before he realizes she thinks he never loved her. The message was that we need to be braver and say the words. Sometimes our actions are just not communicating strong enough. Words plus actions, equals a happy result. This plot was slower than I liked. It was a good Christian clean romance. The characters were easy to like. But there just was not that ‘got to read this’ or ‘this was amazing’ feeling. It felt real. And it was entertaining. Other than that great book. Could have been better but still worth reading.